Aparthotel Arteneiro has 52 bedrooms having originally been built as a hotel in 1972 but was re-modernised in 2006. Aparthotel Arenteiro is located right in the commercial and leisure district of O Carballino. The community of O Carballino in the North-East of the Ourense province was a popular resort in the 60s and is a major holiday destination in Galicia. The spa Balneario de Carballino and the Templo de la Veracruz are just a short walk from the hotel. The Monasterio de Oseira, Rivadavia, Castrelo de Mino and Ourense are just a few kilometres away. Aparthotel Arenteiro, which was renovated in 2006, has as big a future ahead of it as it has an interesting past behind it. It has been a favourite with a number of well-known guests, including the King of Spain. 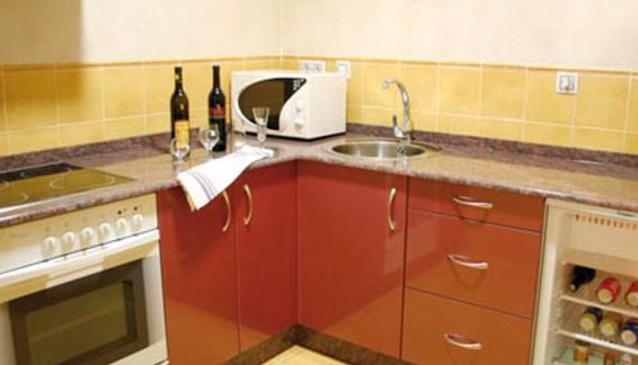 Today it is an apartment hotel, the first of its kind in the province of Ourense. It offers comfortable and contemporary accommodation and a wonderful ambience in the heart of the tourist centre of O Carballino. The air-conditioned building comprises a total of 52 apartments, of which 2 are disability-friendly, on 8 floors. Facilities on offer at the hotel include an entrance hall with 24-hour reception, a hotel safe, a currency exchange facility and lift access, as well as a hairdresser, a cafe and a restaurant. Guests can make use of the WLAN access (charges apply), as well as the hotel's room and laundry services. Parking is additionally provided for those arriving by car. The apartments are spacious, comfortable and bright. They offer guests a bedroom with an in-room safe, a built-in wardrobe and a desk, as well as a dining room with cable TV, Internet access and a sofa bed. Glass and ceramic crockery, a fridge, a microwave and cooking utensils are provided in every kitchen. The bathroom is fully fitted and comes with a shower and hairdryer. In addition, a direct dial telephone, air conditioning and heating come as standard in all apartments. Guests can arrange an appointment for a professional massage on site. They can also make use of a gym, just 100 m from the hotel. Here guests can use the equipment free of charge or follow aerobics or fitness programmes under the supervision of a trainer. There is a car park just 50 m from the hotel (charges apply).